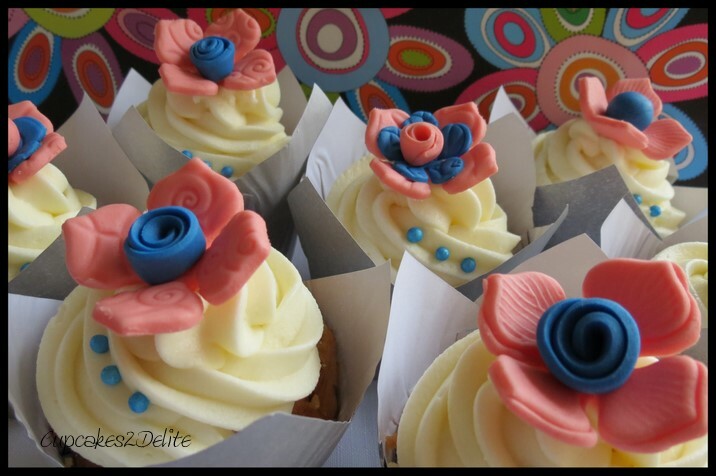 Peach & Blue Flower Birthday Cupcakes! Hayley’s birthday is the last of the year for our Wacky Wednesday Scrapbooking group so it was great to have yet another excuse to celebrate last Wednesday just before the silly season begins! Hayley is great at combining unusual colours, patterns and items in her scrapbooking so I thought I would take 2 colours that I hadn’t used before and combine them into funky flowers for her birthday cupcakes. The peach is a lighter shade of a beautiful watermelon colouring I have and I used it to make these different sugar paste flowers. The sky blue flower centres and blue sugar beads are a perfect contrast to the warm peach flowers. I used different embossing techniques on the flowers as Hayley is also a texture guru when it comes to her wonderful artistic creations. Once again we celebrated another birthday with gorgeous gifts, party packs, cake and cupcakes. 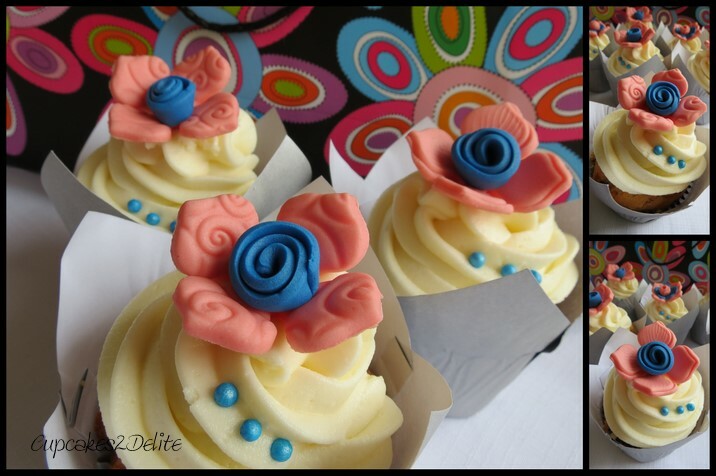 I couldn’t resist photographing Hayley’s cupcakes with the wildly colourful gift bag I chose for her birthday gift. ← Lions Rugby Cupcakes for Juan’s 30th!